And I'm back again! I don't know if I've ever gone a whole week between posts before, but after months of being out of pocket I think it's going to be better for me to stick with Tuesdays until I'm home again. But fingers crossed, that should only be a couple more weeks! 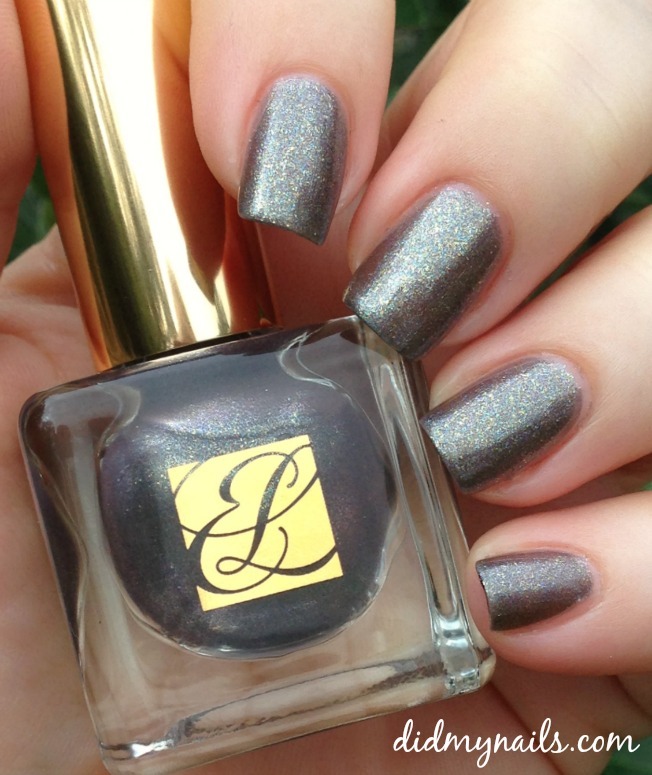 Estee Lauder Chaos is a gunmetal grey with gold and blue-grey flakes and a sparkling, multi-coloured micro-shimmer. That shimmer is easier to see in the bottle and in lower lights; in sunlight it's pewter with those little highlights of blue and gold. off-colour pic, but dat micro-shimmer! I quite like the final effect of this Chaos, but I have to say I wasn't thrilled with the formula. It was very easy to control and flowed beautifully, but half my nails needed four coats to reach opacity (and in all honesty could have taken a fifth), which was troublesome, given its slow drying time. For the price, that's too many coats and too much time, but I really am smitten with that lovely shimmer. 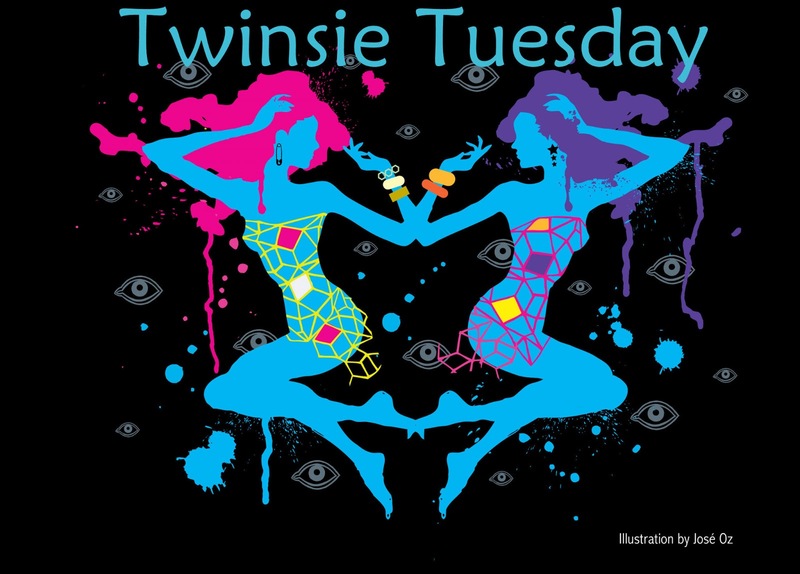 I should be back to regular posting in just a couple of weeks, but in the meantime, please visit my fellow Twinsies to see more splurges--and please come back to see me next Twinsie Tuesday! Smitten as I still am with Pure Ice Shore Bet, I pressed it into service again, this time as a base for some dotted "mosaic" nail art, in expanding circles of Sinful Colors Wisp (white) and OPI Espresso Your Style! (brown). These dots are a fun, simple design to do, even if all those teeny dots do take a little while. The effect at arm's length is awesome, and the colours are great for fall! Speaking of fall colours, I'm betting some of my fellow Twinsies are gonna show off some of this fall's new neutrals today, and I'm already jealous! I'm hoping to make that road trip to Ulta again this week and see what's come in since I was up there in July. Fingers crossed! My friend Liz recently put down some new floor that's beige with black-and-white speckles, so I told her I'd do my nails to match it. And then I did my nails to match it! True story! My base is the gorgeously greige NOPI My Jay or the Highway! (exclamation point included in the name at no extra charge). It is another one of those putty/taupe neutrals I absolutely love, even more grey than my usual faves, and while the Modern Family Collection isn't the most recent, it's a fantastic shade for fall. 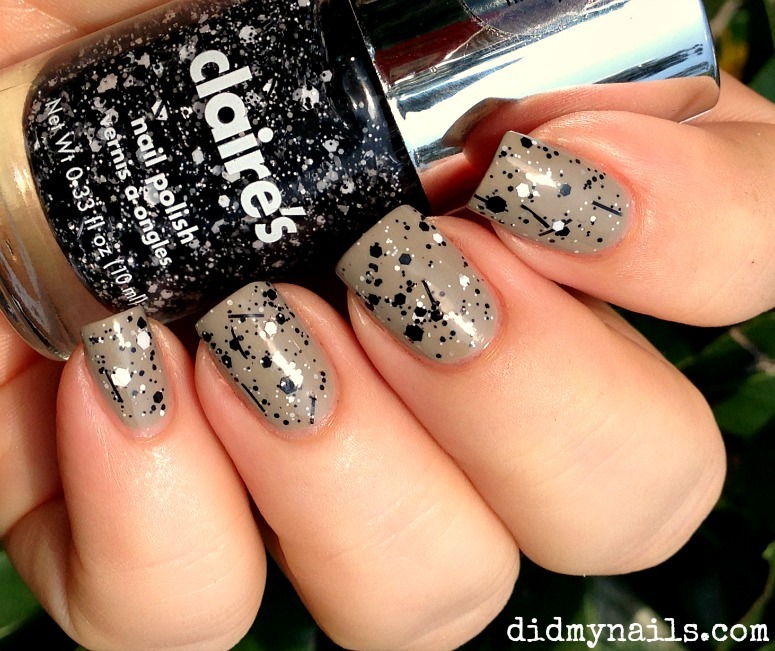 The matte, black and white glitter on top is Claire's Splatter Paint. It has multiple sizes of the black and white, along with some small, black bars. I'm not usually that high on bar glitter, but from just a little bit away these really blend in to add to the "splatter" effect. Coverage was good too; this is just one coat, plus a little extra dabbing, no trouble at all. If you've been wanting one of the indie black and whites, definitely check out Claire's Splatter paint. It looks like Liz's new floor! China Glaze Boundary of Memory took me on a little emotional journey. I saw it in the bottle and had to have it. Then I did the first coat and was kind of bleh. And then I finished it all up and was right back in love. 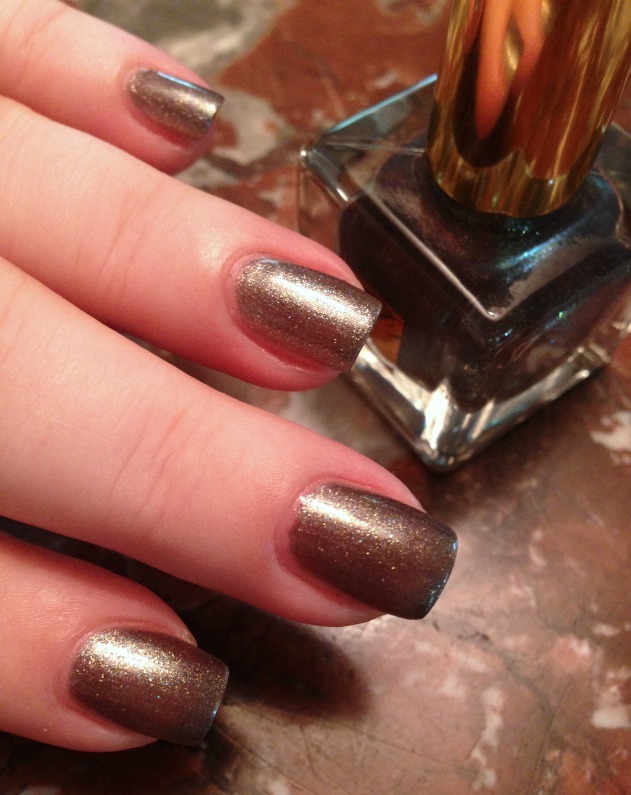 Boundary of Memory, from the China Glaze The Giver Collection, is a full-coverage glitter. It consists of teeny, brassy gold, pale pewter, and gunmetal black micro-glitters in a jelly-like base, and I don't know how it does it, but it's at once dazzling and understated. I mean, understated for a glitter, of course. The gold really catches the light, even in plain, room lighting (and so much better than I was able to catch here, but I was glad to have a nice, sunny day for pics). The formula was just a little fussy, thick enough that it needed a little extra patience, but it was well worth that bit of fuss. It was opaque enough at two coats, but I had a feeling three would look even better, which is what I'm wearing here. And bonus for a micro-glitter, the jelly base dried smooth enough that one coat of top coat was all it needed. Wishing the rich, gold highlights really came across here--Saints and Steelers fans, y'all need this one! My TT post last week had a last-minute accent nail addition, but this week it's the whole group's theme. No surprise, I went flowers! My main polish for these nails was China Glaze Seeing Red, from the recent The Giver collection. I didn't actually think it was that different-looking in the bottle, but on the nail it dried to a very warm, autumnal red with lots of orangey-brown, and I love it! My ring fingers and left thumb got OPI You're So Vain-illa, and over some brown acrylic paint branches, I dotted Seeing Red flowers with little Sinful Colors Wisp (white) centers. I really enjoyed these, and they've got to be the teeniest little dots I've ever managed (at least on purpose... ;p). I will admit, though, that it's getting hard, keeping up posting while I'm still out of town. Chipped nails, iPhone pics, grabbing daylight, wah wah wah, and I don't mean to complain and moan--I just know I'm not posting my best pictures right now, and it's kinda frustrating. Bleh, that's enough of that already. 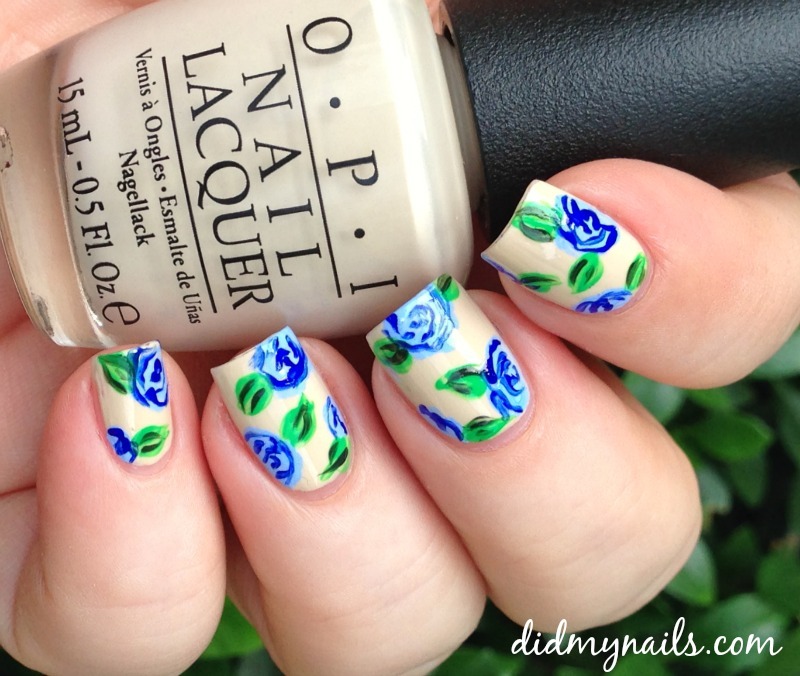 Please check out some of the other TT blogs for more accent nails! OPI Thank Glogg It's Friday is fantastic. In the bottle it didn't really do much for me, but I'm so glad I picked it up anyway. It's like candied apples made from mixed berries and wine. It's a beautiful colour and a subtle shimmer, and yeah, I'm fawning. My heart hearts it. This is three coats of OPI Thank Glogg It's Friday. 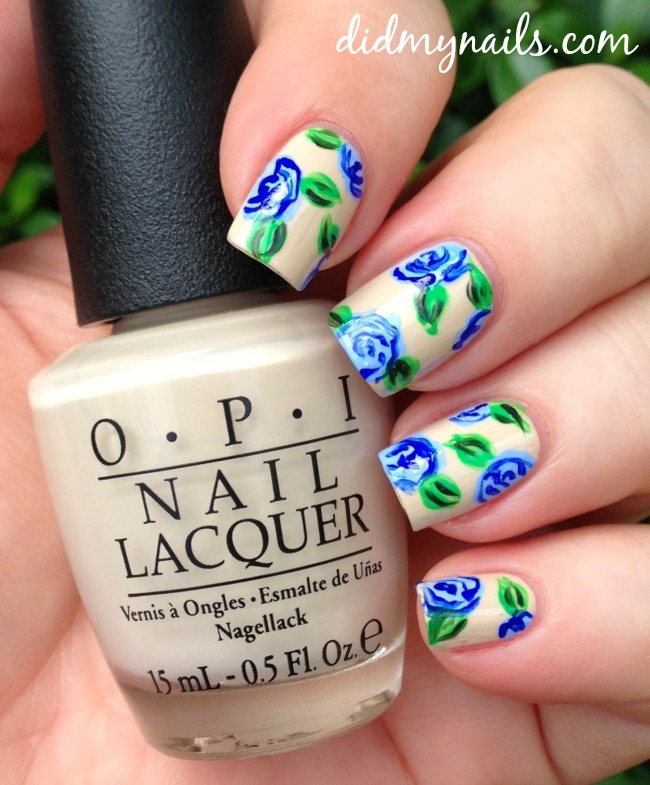 The formula, not surprisingly for OPI, was smooth. Easy to spread and to control. It has a shimmer that really comes out in the sunlight, and in dimmer light, it contributes to a beautiful "candy apple" sheen. Usually after about a day and a half of wearing a certain polish I start feeling like it's time for a change. I've been wearing OPI Thank Glogg It's Friday for about four days now and haven't felt that way at all. If you're on the fence at all about this one, I say go for it! The first coat seemed a little thin, but then, I wasn't aware at first that it was a crelly (and it's on the jelly side of crelly at that). It was very easy to control, though, and built up nicely, leveling well with no pulling or streaks. While I did three coats of Kissy Kiss for the camera, two was probably well sufficient for daily wear. This shade of blue might lobster me a bit...or a lot...but I flat out do not care. It's beautiful, and I heart it to little bits. Pure Ice Shore Bet is a soft, sandy (yeeks, I see what I did there) neutral with flattering, grey undertones. It's taupe, ecru, beige, mushroom, whatever; it's awesome. It had a great formula too! Smooth and easy in two coats, with no streaking or patchiness. This is exactly the kind of neutral I love the mostest and keep finding myself hoarding backups of backups... Definitely getting a backup or two of Pure Ice Shore Bet! Already wearing Sinful Colors Rendezvous from the day before, I got out my acrylic paints and painted some tiny, leafy vines in white and darker teal. Or possibly seaweed. Couldn't swear they aren't beanstalks. Whatever they actually are, they looked really, really cute at arm's length. Unfortunately I managed to ding the ring finger beyond repair, so it got an impromptu Saran Wrap makeover. Over a base of Sinful Colors Wisp (which had a MUCH better formula than Rendezvous!) I did a quick coat of Jesse's Girl Sea Glass, then mashed it with some wadded up Saran Wrap to remove most of the teal before it could dry. It's such a simple technique, and the results are always so cool. Not sure how good at match it is for the sea-vines, but every now and then, needs must. Along with regular check-ups and early detection, information is one of our very strongest allies against ovarian cancer and PCOS. To learn more about symptoms and treatment, please visit ovarian.org or pcosaa.org, and for more teal nails, stop in and visit some of the other Tuesday Twinsies! I was so eager to get my hands on OPI You're So Vain-illa for a couple of reasons. One, Diet Coke with Vanilla was one of the great loves of my life (years later, I'm still heartbroken that it's not on the market anymore). Two, I just knew it was going to be a great base for nail art! Unfortunately my swatch pictures of Vain-illa were a total mess, and I can't even tell you how much I'm missing my tools and lightbox and everything at home. But while I've been "winging it" on the road for so long, I've been so lucky to spend all this extra time with my grandparents, and that part has been FANTASTIC. So yeah, I put some flowers on my fingernails! I was wearing a royal blue top this day, and they looked all kinds of cute together. And hey, my new acrylic paints and brushes seem to be working out well, so big-time yay for that! Still no idea when I'm going to get home, but I'm having a great time where I am. Soft, Tiffany-esque teals always, always stop me dead in my tracks, so when I spied a ginormous display of Sinful Colors Sinful Shine shades, I zeroed right in on Rendezvous. And then I bought some others too. But Rendezvous was easily my top pick of the bunch! This is three coats of Sinful Colors Rendezvous (with top coat). The Sinful Shine line was apparently a Walgreens-exclusive collection last year, but I picked these up a couple of weeks ago at Wal-Mart. How much do I love this colour?! So, so pretty. Crazy-high marks for pretty. Formula, however...not so much. Sinful Shine comes "with Gel Tech," but I don't know what that actually means. It seems like every brand needs to have a gel line these days, and I'm never sure which ones are trying to be a real 14-day gel manicure-like application and which ones are just throwing the term "gel" in there name because it's the current thing. But whatever Gel Tech means I'm not sure it's doing Rendezvous any favours. The first coat was patchy and streaky, and I needed a good three coats to get an even application. The polish was thin and runny; strangely, it was also stringy and thick. So, worst of both worlds. All three worlds, in fact, because the dry time was terrible too. I have worn this polish twice now and gave it well over an hour to dry both times, and both times I woke up with sheet marks. The display boasts that these shades are shinier than a patent leather shoe, and while I don't have any patent leather handy for a comparison, I can easily give it a "Wow, that is some shine!" Tons and tons of shine. The shine is AWESOME. Unfortunately I needed top coat to smooth those sheet marks, so it didn't get to be shiny on its own. Hopefully the other Sinful Shines I picked up will have a better formula. Rendezvous is so beautiful and really does shine like crazy, but for all that I love this exact, amazing colour, I don't see myself wearing it very often. 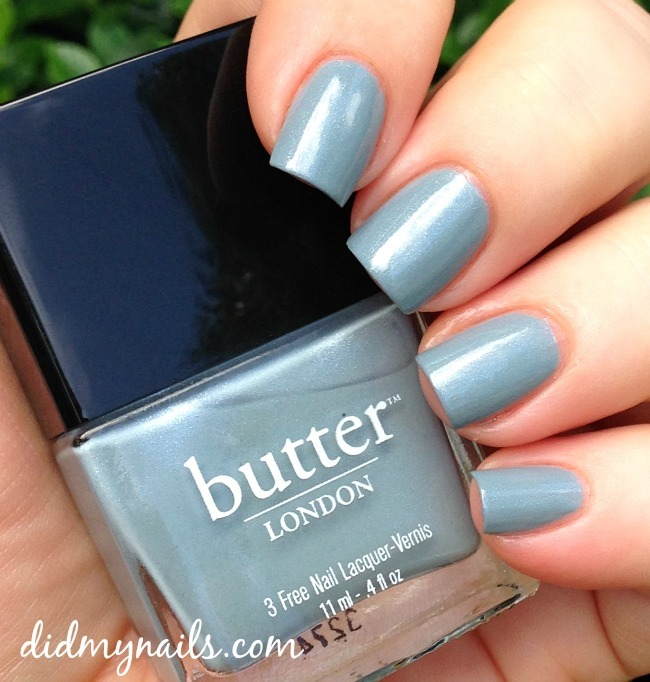 Surprise awesomeness, when I drove up to Ulta, they were having, basically, a buy-one-get-TWO sale on some of their older butter LONDON polishes, which landed several great, new shades in my collection, including lovely Lady Muck. This is three coats of butter LONDON Lady Muck. The first coat was thin, sort of patchy and streaky. I'll admit the formula wasn't all that great--it was somehow thin but thick at the same time, and it got a lot of help from some rushed top coat to level out. I haven't seen that in other reviews, though, so maybe it's just my bottle/batch? Whatever the reason, the results were so nice that I ain't even mad. 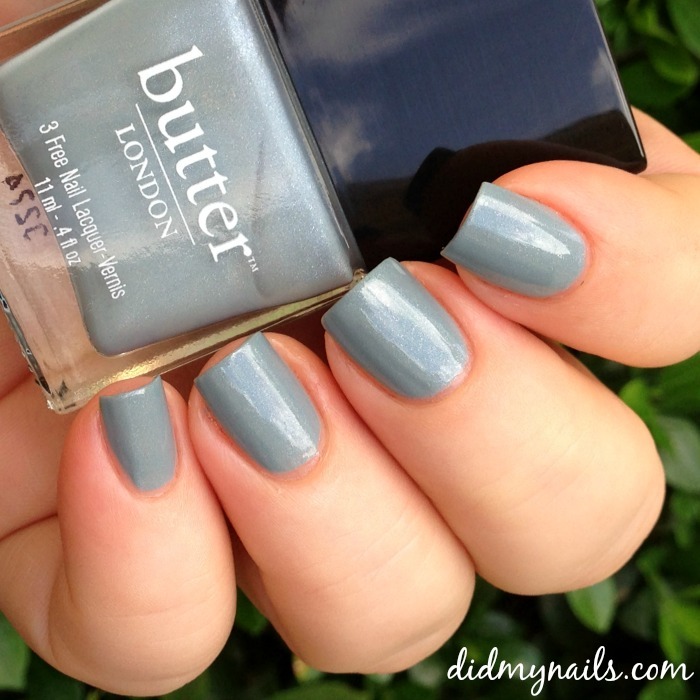 butter LONDON Lady Muck reminds me very much of one of my all-time favourites, China Glaze Sea Spray, all greyed-out cornflower blue with that super-fine shimmer that gives it a...I'm not even sure how to describe it...a sort of pearl-ish, candy coating of prettiness. I may do a comparison post when I get home to my beloved Sea Spray, but at a glance I'd say that Lady Muck is a little darker and more blue. Ooh, note to self: If they were running a sale on bL to make room for new ones, they may have...some new ones! Time to head back to Ulta! Another Twinsie Tuesday, and this week's theme is a transitional polish pick, a shade that carries over from summer to autumn, and my choice...well, my choice from the bag on the counter that's doing its valiant best to stand in for my stash while I'm on the road...is a brand-new beauty to me, Finger Paints Hammered Terra Cotta. When I picked up Hammered Terra Cotta, I had no idea it was a texture, but I really like it! It's full of rosy pink, sparkling gold, and yes, terra cotta orange. I'm wearing two coats here, but it was actually great in just one. Easy, smooth formula. Nice drying time. Awesome glimmer in the sun. I can totally see Finger Paints Hammered Terra Cotta as a summer polish, maybe with a pair of white shorts and a lemon yellow top (and I'd put good money on it looking fabulous with tanned and darker skin tones). I can also see this as a fantastic choice for fall, looking rich and warmly golden with some jeans and a cozy, neutral sweater and some high, brown riding boots, and suddenly I'm in the mood to go shopping. While I do that, please check out some of my fellow Twinsies' blogs for more transitional picks!